Here’s a nurse that I can relate to. She’s mature. 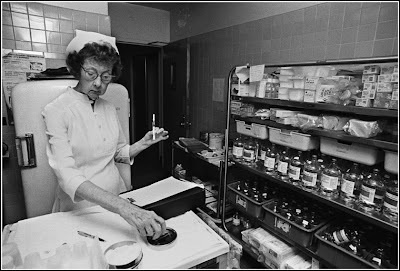 That’s code for “old as the hills.” She is in the medication room, getting ready to pass medications to her patients. Look at the frown on her face. She’s not happy about all the new technology she has to deal with at the nurses station and in the medication room. Mature nurses occasionally wish that they could dump clumsy glumeter machines, and go back to checking a patient's blood sugar by using urine dipsticks. Sometimes we yearn for the good old days. I’ve had many youngsters fresh out of nursing school ask me why I’m still working as a nurse. Nursing is a stressful job, and they wonder when I’m going to retire. I tell them that I’ll have plenty of time to rest when I’m dead, and as long as I have a pulse, I'll keep working as a nurse. Besides, who will teach young nurses what they need to know if all of the mature nurses go out to pasture? Minnie was quite a lady. When she was 23 years old, she joined the American Red Cross in 1918 and traveled to France to care for wounded troops during World War I. She told us about her adventures in Europe, and fought back tears when she talked about the soldiers who died in her arms. She also showed us her extensive collection of nursing school pins and explained the history of each school. When one of my classmates asked Minnie what she did at the nursing home, Minnie laughed and said, “I give people hope. They figure if I can still work, they can at least get up and live another day.” She said that since she wasn't dead yet, she was going to keep working as a nurse. Minnie never married, and her life revolved around the nursing profession. We heard several months later that when Minnie didn’t show up for one of her shifts, the nursing home administrator became alarmed and met the police at Minnie’s house. They broke into the house and found that she had passed away in her sleep. I don’t know that I’ll be working when I’m 80 years old, but I can’t imagine that I’ll leave nursing anytime soon. I'm glad that Minnie never retired. She served as an inspiration, and taught me about nursing’s history. I hope someday a young nurse will hear my words and think the same thing about me. I've been saving for 15 years and now have enough money to retire for 1 year LOL. Guess I'll be working when I am 80 too. Keeps your mind active. Oh, Nurse Ratched, I loved that story. I am glad you will stay on the job. As you said, it's important for the experienced (mature) nurses to pass on all of their knowledge. 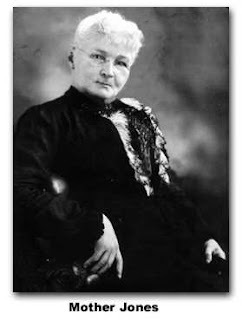 It is nice to put a face with a name, Mother Jones. Thank you for not contributing to the nurse shortage I've been reading about. Good for Minnie! That was a cool story. Lord, I am so tired now--I can't imagine how tired I'll be at 80...aargh!! 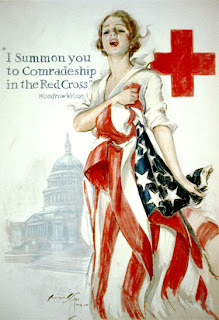 The Creed of the Red Cross Nurse is one of the most beautiful sets of ideals ever written. You're just cooler'n sliced bread, MJ. :D Great story. I'm tagging you. You're it! apgaRN tagged me with a nursing meme I'm hopin you'd be interested in, too. The question is: "What can you not live without?" Shane at nursingjobs.org started it, tagged two nurse bloggers with the idea to post, tag two more. If you've got the time and inclination, I'd love to hear your answers too. ApgaRN and PixelRN had some cool things to say, too. To do no harm I figure if I can keep helping folks out and not doing them harm I will kepp on keeping on. Or as my grandmother(also a nurse) used to say " I'm a nurse. That's not only what I do but who I am" I cannot imaginje doing anything else ever!As crappy of a job as it is sometimes well most of the time it is also the most rewarding thing I have ever or will ever do in my life! At least she got to go in her sleep. That's how I want to slip out! Nice story and an inspiration to all nurses. Experience is essential, not youth. OMG! I have tears in my eyes. What an amazing woman! How lucky you are to have met her. God bless Minnie! What a life of blessings to others. I'm with you, you retire: you die. I'm getting my PhD before I'm sixty (that gives me ten years and four months) and I'll either die with a textbook in my hand or standing at the front of a classroom - as an RN from the old days. And I intend to wear my cap!